Damned Yankee: Was Steinbrenner’s Partner the “Madoff of Memorabilia”? Barry Halper even fooled "The Mick" with a forged #6 1951 Yankee rookie jersey. This photo and graphic appeared in the official Baseball Hall of Fame tourist brochure for the Barry Halper Gallery from 1999 to 2001. Barry Halper sure could tell a story. Not only could he weave them, he collected them along with the artifacts that comprised what many considered the greatest baseball trove this side of Cooperstown. What started as the innocent pastime of an eight-year-old autograph hound patrolling Ruppert Stadium in Newark, New Jersey, became a lifelong obsession for the man who would amass the world’s largest private baseball collection. Thirty years after he received his first souvenirs from the Newark Bears, Barry Halper even ended up fulfilling his childhood dream of owning a small piece of the New York Yankees as one of George Steinbrenner’s limited partners. "Shoeless" Joe Jackson's alleged 1919 White Sox jersey was featured prominently in the 1999-2001 "Memories of a Lifetime" exhibition in the Baseball Hall of Fame's "Barry Halper Gallery." The “forgotten” rarities Halper claimed to have discovered were staggering in scope, and the stories of their acquisitions became legendary. He recalled for Sports Collectors Digest how he once drove to Greenville, South Carolina, from the University of Miami in the late 1950s to visit “Shoeless” Joe Jackson’s widow and purchase the slugger’s 1919 Black Sox jersey and other relics. He told Mickey Mantle that Yankee clubhouse attendant Pete Sheehy once gifted him a bag containing the Mick’s 1951 rookie jersey. He told Sports Illustrated he tracked down Ty Cobb’s biographer Al Stump and purchased Cobb’s own diary and the shotgun Cobb’s mother used to kill his father. He wrote an essay in Total Baseball revealing the story of his acquisitions of rare 19th century uniforms and Babe Ruth’s first Yankee jersey (autographed) from an old-time Brooklyn Dodger named Ollie O’Mara. He described to writer Peter Golenbock how he acquired the game’s oldest baseball from 1846 directly from the family of Hall of Famer Alexander J. Cartwright Jr. (with letters of provenance from Cartwright and his kin). From a man in Iowa, he secured a lock of Babe Ruth’s hair with a letter of authenticity from the Bambino himself. Halper told the New York Times he got the Ruthian lock by trading him some of General George Custer’s hair. He described for the New York Times how he traded Lou Gehrig’s widow six bottles of J&B Scotch in exchange for the uniform in which Gehrig made his ”Luckiest Man Speech.” Halper even claimed to have acquired Gehrig’s last glove from his replacement, Babe Dahlgren. Halper told USAToday that he’d honed his collecting skills as an eight-year-old, in 1948, when he jumped under a Yankee Stadium police barricade to get the autograph of an ailing Bambino on “Babe Ruth Day.” Then, Halper claimed, he took that same sheet the Babe signed with him to college where his baseball coach at the University of Miami, Hall of Famer Jimmie Foxx, also signed it along with Mel Ott who once visited with his coach. 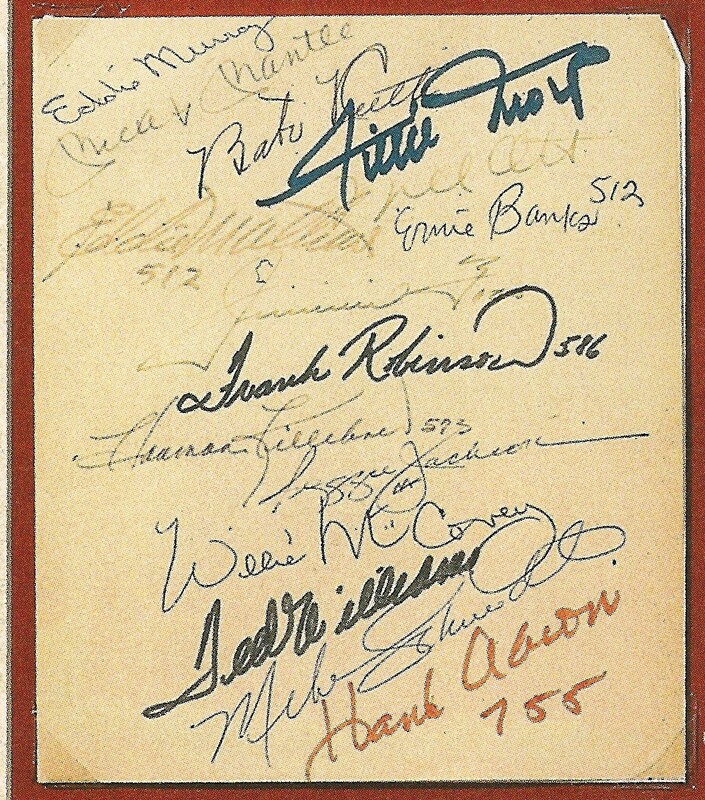 The sheet then had the signatures of all three men who hit 500 home runs. Halper served up stories like this one as if on cue, and the media ate them up accordingly. Fueled by the cash generated by his family’s paper products business, Halper successfully wheeled and deal-ed his way into an other-worldly stratosphere of collecting. By 1985 he claimed to have “more than a million cards, 864 uniforms, 3,265 autographed baseballs,” as well as boasting that he had the autographs of every single player ever enshrined at Cooperstown. Halper’s friend, Bill Madden, of the New York Daily News and Sporting News, called Halper’s house “Cooperstown South,” and in no time comparisons and a friendly rivalry developed between the collector and the shrine. Halper, conversely, told reporters he thought his collection was superior to that of Cooperstown, and that the Hall would have to pay big bucks if it wanted it. Halper had other visions of his own museum in Hoboken, New Jersey, home of the former Elysian Fields, where the pioneer Knickerbocker Base Ball Club played its games as early as 1846. Like most, Halper thought Cooperstown’s Abner Doubleday myth was a fraud, and considered Knickerbocker Alexander Joy Cartwright Jr. the game’s true “father.” Still, in spite of his Doubleday disagreement, Halper was generous enough to donate to the Hall a duplicate he had of the rare T-206 Honus Wagner tobacco card, which Cooperstown’s collection was lacking. 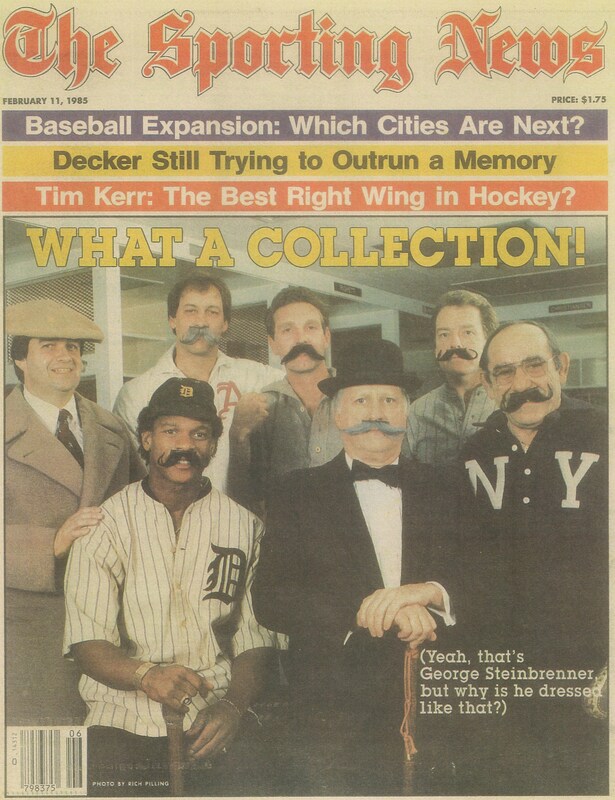 Halper posed with his partner George Steinbrenner for this 1985 cover shot for The Sporting News featuring five bogus jerseys that he alleged were the gems of his collection. But the Hall of Fame also owned something Halper didn’t have and coveted desperately: a particular uniform. Archived on an actual dry-cleaner’s carousel in a secret compartment of his home, Halper claimed to have an example of a game-used uniform or jersey of every player ever inducted into the Hall of Fame, except for one of pitcher named Eppa Rixey. The Hall of Fame actually had Rixey’s jersey. Halper told Franz Lidz of Sports Illustrated he offered the Hall a Ty Cobb uniform for it and even offered to “throw in a Gehrig.” When he heard the Museum could not legally make such a transaction, Halper told Lidz, “I’ll just have to go through life missing an Eppa Rixey.” Halper was used to having it all. It was Halper’s proclivity to “have it all,” though, that first raised some skeptical eyebrows in the high-end collecting world. When Halper announced to Sports Illustrated’s Robert Creamer his 1982 acquisition of Tommy McCarthy’s last will and testament, he said it was the final item to complete his full set of Hall of Famer signatures. If he ever found an Eppa Rixey uniform, his set of Hall of Famer uniforms would then be complete. Halper looked at these amalgamations as if they were sets of baseball cards with a checklist. The problem was that several insiders knew that attaining such complete runs of signatures and uniforms was virtually impossible. Halper was defying the principles of logic. Additionally, rumors had swirled about for years regarding Halper’s possession of rare photographs and documents stolen from institutional collections, including the New York Public Library and the Boston Public Library. In the mid-to-late 1970s, the NYPL lost hundreds of photos and thousands of documents from its famous “Spalding Baseball Collection.” Likewise, the BPL lost close to thirty-percent of its famous “McGreevey Baseball Picture Collection.” When Halper responded to an inquiry into the BPL thefts in the 1980’s, he categorically denied ever owning items from the library. The mystique afforded Halper by the hundreds of press clippings included in his scrapbook never hinted at the darker side of the Halper memorabilia empire. Accordingly, it appears that Halper wielded his own influence in the industry to keep it that way. Because he was a primary source of material for a host of prominent auctioneers and dealers, one hobby veteran told us, “No one wanted to rock the Halper boat with issues of title and authenticity. The guy was like the golden goose.” Halper’s items usually came with inscribed index cards from players or family members attesting to the items’ legitimacy. Another prominent collector said, “Items that came from Halper had a special cache because he was so famous and a Yankee owner to boot.” Halper himself even claimed to have originated the term “Letter of Authenticity” for the hobby. 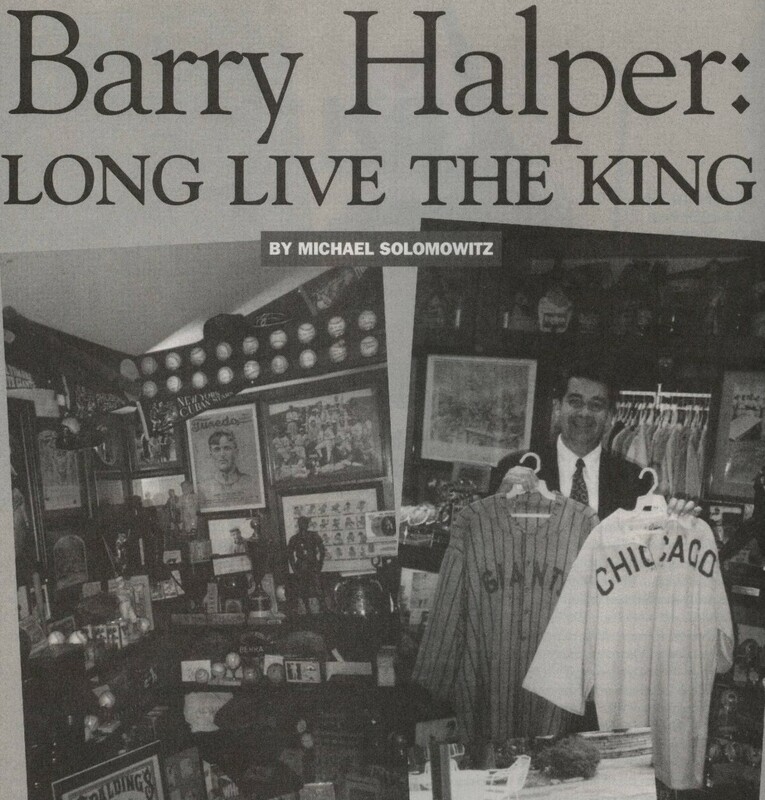 Halper was featured in this 1994 "Encyclopedia of Sports" magazine feature, "Barry Halper: Long Live the King." Halper is holding his alleged jersey of HOFer Cap Anson, which sold for $36,800 at Sotheby's in 1999. By 1995, Halper’s plans for his own Hall of Fame or museum in Hoboken or New York City had failed and, having suffered a heart attack in 1994, he focused on an exit strategy for his collection. So Halper approached Christie’s Fine Art Auctioneers to formallly appraise his holdings. Then he retained the investment banking firm Lazard, Freres & Company to market his entire collection to willing buyers. The item-by-item appraisal done by Christie’s put a value on the collection that exceeded $40 million. But in the three years following the Times announcement that Halper was selling, no one came to the table at the $40 million asking price. So Halper decided that the best outcome for the collection was to auction it all off at Sotheby’s. In turn, dealers, collectors, and auctioneers in the industry looked forward to a once-in-a-lifetime opportunity to stock up on the king’s ransom. Even the Hall of Fame came to the table as Hall Chairman Jane Forbes Clark persuaded George Steinbrenner and his fellow MLB owners to contribute to a $7.5 million fund to secure select items from Halper for the Hall, before the Sotheby’s sale. At the same time Sotheby’s was in the midst of cataloguing the rest of Halper’s trove, including many other rare and unique jerseys dating back to the nineteenth century. In 2005, the New York Daily News reported that when MLB purchased from Halper in 1998, “the Hall of Fame passed on several jerseys because it deemed them fake.” Subsequently, Sotheby’s and their consultant Rob Lifson hired authenticators Grey Flannel to examine all of the uniforms presented for the Halper sale. The scrutiny brought about by Evans’s claims and the fact that the Hall of Fame allegedly passed on or returned numerous garments they had at first selected no doubt created challenges for the Sotheby’s staff and the consultants creating the auction catalogue. Writer Peter Golenbock had written the introduction for the catalogue, marvelling at Halper’s acquisitions of early uniforms. Golenbock described how Halper was introduced to an old ballplayer named Ollie O’Mara who “had a collection of turn-of-the-century items.” Golenbock stated that O’Mara was a major source for Halper, one that ”that never failed him.” In talking to Halper, Golenbock learned and wrote that, “Through the former Dodger, Barry acquired uniforms once worn by nineteenth century legends John Montgomery Ward, Cap Anson, Mike Kelly, Hoss Radbourn and Charlie Comiskey.” But the talk among advanced collectors and dealers like Josh Evans was that the early Halper uniforms were to be avoided. Although O’Mara’s name appeared in the introduction to the catalogue, none of the Halper lot descriptions mentioned an O’Mara provenance. Ironically, the man Halper wrote his Total Baseball essay with in 1993, Bill Madden, also wrote more recently in the New York Daily News that the Wilbert Robinson and Hughie Jennings jerseys were included in the group of uniforms that the Hall of Fame rejected as fakes in 1999. When the Sotheby’s winning bidder put his Robinson jersey up for auction in 2009, Legendary Auctions told him the jersey was not authentic, based on comparisons to another Baltimore jersey they sold as a consignment directly from the family of player Bill Hofer. The Robinson jersey that sold for $26,000 at Sotheby’s didn’t even fetch $2,000 at Legendary. So why wasn’t such a great story of provenance included in the original Sotheby’s lot description of the Robinson jersey? And if there was controvery over the authenticity of the alleged O’Mara items, why was the jersey included in the sale? Did Sotheby’s know that the jersey had been rejected by the Hall of Fame? More important, why would Halper have lied about O’Mara to Sotheby’s head Marsha Malinowski? 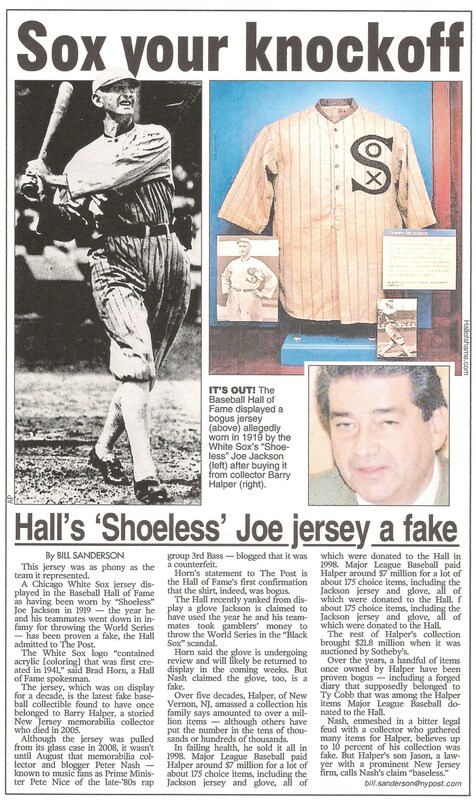 The answer likely lies in the blockbuster announcement made by officials at the Baseball Hall of Fame this past October in regard to Halper’s donated “Shoeless” Joe Jackson jersey. In response to a report published by this writer in August of 2010, claiming that the Jackson jersey was not authentic, Hall spokesman Brad Horn admitted to the New York Post that the jersey that Halper sold to MLB in 1999 was a fake. 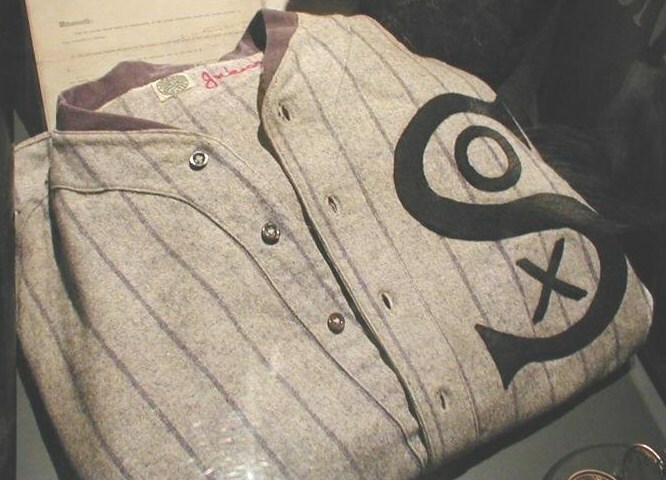 Horn confirmed that tests conducted on the garment revealed that the White Sox logo affixed to the jersey ”contained acrylic (coloring) that was first created in 1941.” In addition, the Hall also confirmed that the fibers used to secure the logo to the garment were made of polyester, a material first introduced in the 1950s. Considering the Hall of Fame’s findings, the story Halper had told MLB and the Hall about acquiring the jersey directly from Jackson’s widow in her home during the 1950s was impossible. Furthermore, in 1985 Halper told yet a different story to Bill Madden of the Sporting News, stating that the jersey was a “recent acquisition,” purchased through the mail in a cash deal with Jackson relatives. Since the Hall of Fame’s revelation in October, Halper’s collection has been scrutinized closely, only to reveal more troubling instances of items found to be inauthentic, fraudulent, or stolen. Upon close examination, it appears that many of the signature items in the deceased Yankee partner’s collection, the ones written about extensively for years in the press, are not what Halper said they were. Halper’s breathtaking items are turning out to be fakes that just bolstered the legitimate but less scarce items that constituted the bulk of his collection. The autograph Halper said he got from the Babe in 1948 has been deemed a forgery by experts; so has Ruth’s letter authenticating his alleged lock of hair (the hair is bogus, too). In 2009, Ernie Harwell reported, in the Detroit-Free Press, that the FBI determined Halper’s Ty Cobb’s diary was a forgery, and in 2010 expert Ron Keurajian determined it was likely forged by his biographer, Al Stump. SABR researcher Ron Cobb proved in an article he published last August that Cobb’s mother shot his father with a pistol, not with Halper’s shotgun that was featured in SI. Ollie O’Mara’s son claims that his father never sold Halper any uniforms and that his father was a fugitive from 1950 to 1966 and only saved a scrapbook from his playing days with the Dodgers. The Last Will of Tommy McCarthy, that rounded out Halper’s Hall of Famer autograph collection, has been confirmed as stolen from a Boston Probate Court. A crown jewel of Halper’s collection and a key item for his plans to develop a museum in Hoboken , his alleged 1846 Knickerbocker baseball, was considered counterfeit by many advanced collectors who claimed the ball was the wrong size and construction for the period. The 1865 letter that accompanied the ball in the Sotheby’s sale was confirmed as stolen from the Archives of Hawaii. The letter was featured in Ken Burns’ PBS documentary, BASEBALL. The ball and letter sold for $139,000. 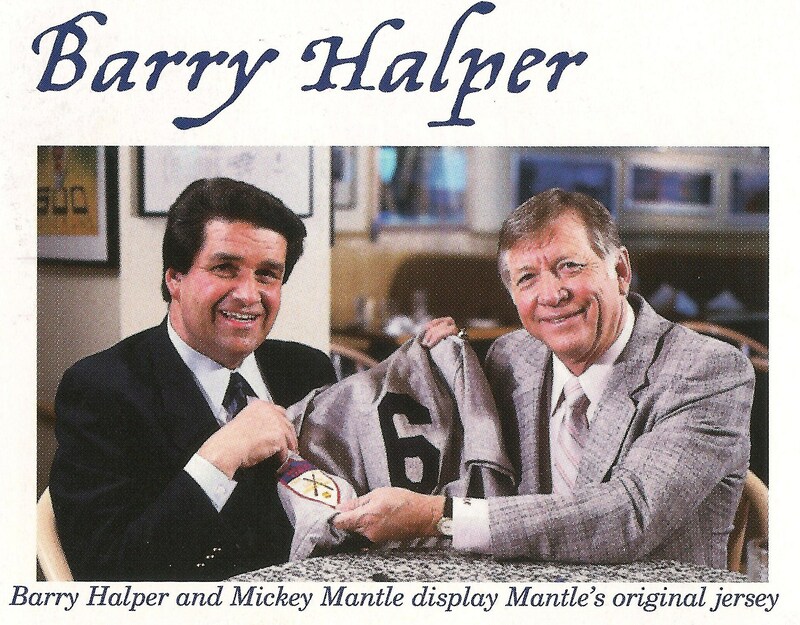 Perhaps the most stunning revelation was that Mickey Mantle’s 1951 rookie jersey, which MLB purchased from Halper in 1998, and featured in Hall brochure, was returned to Halper by the museum as a forgery. Hall of Fame officials denied even being donated the jersey when initially questioned, but a source at the New York Post says that the Hall of Fame confirmed the jersey was returned to Halper. Hall representatives did not, however, reveal when it was returned. In 1989, while filming a segment with Mantle for a commercially released documentary about his collection, Halper told Mantle how Yankee clubhouse manager Pete Sheehy gave him the jersey after Halper told him he had Babe Ruth’s rookie jersey (which has also been deemed a forgery). Halper got Mantle to autograph the jersey on camera and also secured a signed index card from Mantle that read: “To Barry, This is my rookie uniform. I wore No. 6 for the first half of the season….” In 2007, the jersey was consigned to auction by Halper’s widow and was sold as a “replica” of Mantle’s rookie jersey. Nowhere did the auctioneer mention that the “replica” was the same jersey that was purchased by MLB as authentic, nor that it was returned to Halper under suspicion of being a forgery. Another controversial Mantle item was one Billy Crystal paid $239,000 for, a glove advertised by Halper and Sotheby’s as Mantle’s Rawlings model from c. 1960. In 2003, the New York Daily News reported that a glove designer from Rawlings, Bob Clevenhagen, said the glove was, “Made no earlier than 1964 and most likely used in 1966.” Crystal did not respond to numerous calls from the News. Even more embarassing was Halper’s sale of Lou Gehrig’s “last glove” at Sotheby’s for a record price of $387,500, when Gehrig’s authentic last mitt was on display at the Baseball Hall of Fame, a donation by Gehrig’s mother as part of her last will and testament. When Halper acquired the glove from ex-Yankee Babe Dahlgren in 1980 Dahlgren didn’t claim it was the Iron Horse’s last glove and said he was given the glove one year after Gehrig retired. But Halper’s Sotheby’s description changed that story for potential bidders claiming Dahlgren got the glove from Yankee clubhouse man Pete Sheehy on the day of the Iron Horse’s last game. In 1989 Halper told Smithsonian Magazine that his father originally gave him this 500 Home Run club sheet when it only featured Babe Ruth's alleged signature on it. But when Halper sold it for $50,000 at Sotheby's in 1999 he said he had the Bambino sign the sheet for him in person as a young child. Experts have determined the Ruth signature is an amateurish forgery. Sources estimate that at least $2 million worth of Halper items from the Sotheby’s auction in 1999 were either non-genuine or outright fraudulent. The Hall of Fame’s donated items from the MLB purchase of 1998 include at least another $2 million in fakes, including Joe Jackson’s jersey, bat, glove, and pocket watch, as well as Mickey Mantle’s rookie jersey and Ty Cobb’s diary. Evidence does suggest that Halper knew all, or most, of the items he acquired from Ty Cobb’s biographer, Al Stump, were forgeries, including the alleged shotgun used to kill Cobb’s father and Cobb’s dentures. Sotheby’s pulled the shotgun from the sale, but sold all of the other Cobb-Stump collection items. In addition, it turns out that Halper’s Sotheby’s sale also included significant items confirmed by the FBI as stolen from the New York Public Library and others stolen from the Boston Public Library, the Archives of Hawaii, and the National Baseball Library in Cooperstown. Sources indicate Sotheby’s sold a quarter-million dollars worth of items that had been stolen from institutional collections. When Halper died in 2005, his estate put up for auction the remaining items he retained in his personal collection. Some of the items his widow found in their home featured ownership marks of the New York and Boston Public Libraries. The FBI took possession of the New York Public Library items, and the others were returned to Boston. But as more details have emerged about Halper’s conflicting acquisition stories about the Jackson jersey and other items, it is clear that Halper knew that he was selling fraudulent and stolen materials. As new evidence surfaces, allegations are also being made that Halper was actually involved in the fabrication of fraudulent relics and that he orchestrated pay-offs to the relatives of a Baseball Hall of Famer for bogus letters of provenance to support those items. Sources indicate that those closest to Halper while he was living feel betrayed. With all of the accolades and praise showered on him by the press for decades, it is hard for some to come to grips with the magnitude of Halper’s probable fraud. The record established in newspapers and books is now littered with false information and fraudulent artifacts. Even Halper’s obituaries highlight fakes from the collection. In 2009, Halper’s old friend Bert Sugar devoted a full-page photo of Halper’s fake Jackson jersey in his coffee table book, Bert Sugar’s Baseball Hall of Fame, but after the New York Post reports were first published Sugar said he was working with his publisher, Running Press, to correct future printings. This plaque honoring Barry Halper still hangs in the Hall of Fame's "Halper Gallery." 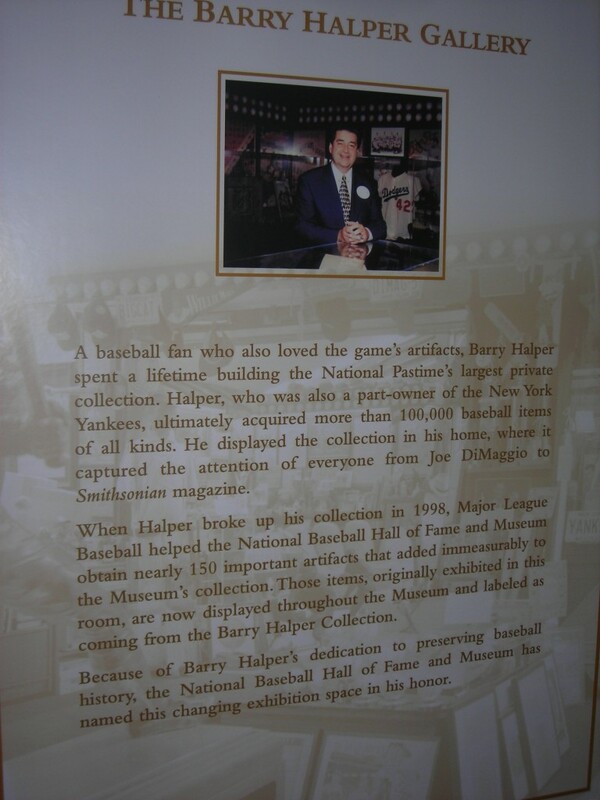 In Cooperstown, the Hall of Fame’s Museum floor plans given out to visitors still feature the “Halper Gallery,” just a stones throw from the Hall’s gallery of bronze induction plaques. The gallery now hosts temporary exhibitions in a space covering 1,100 square feet. Funding for the construction of the space was furnished by a grant from the Yawkey Foundation II. The startling revelations about Halper’s collection have fueled additional discussion regarding the Hall of Fame’s responsibility related to the Halper scandal. Baseball luminaries and historians alike have also wondered if the nondescript gallery should still bear Halper’s name? Halper’s widow, Sharon Halper, inherited her husband’s two percent ownership interest in the New York Yankees limited partnership and is listed as a partner in the team’s current 2011 season yearbook. When asked if the Hall was considering removing Halper’s name from the exhibition space tied to MLB’s purchase from Halper in 1998, Hall spokesman Brad Horn declined comment. This 1999 HOF brochure featured a floor plan highlighting the McGwire-Sosa "Great American Home Run Chase" exhibition and the Halper "Memories of a Lifetime" exhibit in the Halper Gallery. The brochure features a picture of the Halper exhibit, including the counterfeit jersey of "Shoeless" Joe Jackson. Perhaps the ultimate irony in the Halper-Hall of Fame saga is the involvement of Hall Chairman Jane Forbes Clark, the granddaughter of Hall founder Stephen C. Clark. Clark, a world renowned art collector and philanthropist was responsible for displaying the museum’s first fraudulent artifact, the “Abner Doubleday baseball,” which was alleged to have been used by Doubleday and his classmate Abner Graves. Jane Forbes Clark, who called Halper the “Babe Ruth of collectors” was instrumental in convincing the MLB owners to contribute to the fund that enabled the Hall to purchase his alleged treasures. In putting the deal together, she made it possible for Halper’s fake “Shoeless” Joe Jackson shirt to tour the nation as part of the Hall’s travelling exhibition “Baseball as America.” It is ironic that Clark’s great-great-grandfather co-founded the Singer Sewing Machine Company, and that Clark is the sole heir to the Singer fortune, because last October the Hall published their own article about the fraudulent Joe Jackson jersey and noted how the fake garment featured, “Jackson’s stitched name made of rayon.” In the end, the Hall of Fame and Clark were defrauded by a forger’s handiwork with a common sewing machine. The counterfeit Jackson jersey was displayed publicly by the Hall for over a decade. Collector Chris Sullivan, of Duxbury, Massachusetts, considers himself one of Halper’s victims. The Red Sox fan decided to purchase from the Yankee limited partner’s collection because of his reputation as the king of collectors. Like many other aficionados, Sullivan was originally thrilled with his purchase of an alleged 1907 jersey of Boston’s greatest third baseman, Jimmy Collins. But twelve years after raising his paddle at Sotheby’s and paying more than $31,000 for the jersey, Sullivan was informed by uniform expert Dave Grob that his jersey is a fraud, showing evidence of foul-play and suspect tagging. What’s more, the jersey features a red logo. Jimmy Collins was traded away to Philadelphia in July of 1907, and the Red Sox didn’t actually wear ”red” until 1908. 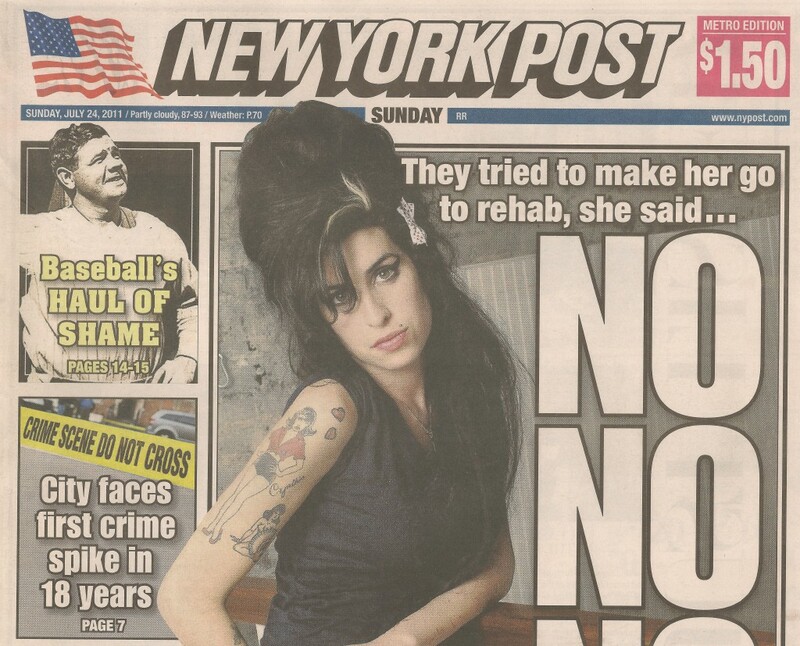 The story of the Barry Halper memorabilia scandal made the front page of the New York Post on Induction Day, 2011. It all is as plain as the nose on your face,Halper was a low life no good crook and should of did time for all he robbed ,out of there hard earned money.As far as the HOF goes, they are all to ignorant to remove all that junk and would rather have the people look at bogus stuff ,rather than remove it and eat crow for it. Despite the opinion of Commissioner Vincent, I am not holding my breath that a change to the naming convention is in the offing. Private institutions are typically very insular and resistant to change unless there is a compelling external force. Not to diminish the efforts of the HOS, but change has two components; physical and intellectual. Until the National Baseball Hall of Fame and Museum starts to think differently about itself, it roles and responsibilities, and “what the right thing to do” in this matter is as it relates to those roles and responsibilities, then physical change (renaming of the gallery, passionate effort to recovery artifacts etc.) should not be expected. Once again, thank you for putting these facts out there for people to see and think about as it is a necessary evil to know what you are up against in life with far too many criminals turning these things out only for $$$. I heard Halper had an old Heinz pickle jar that allegedly contained “the Babe’s” bottled flatulence from an infamous 1928 farting contest between Ruth and Bill Dickey. Rumor has it that Dickey won on odor, while Babe took the crown on duration and volume. However, recent DNA tests confirmed that the famous farts contained in the jar cannot be the Babe’s. Said fart gas was likely supplied after the contest by clubhouse attendant Ralphie “Smuds” Johnson, who often came in to “pinch fart” for Ruth while the Babe was chasing hookers in the bleachers. Yet another fraud from old Barry. All these years bragging that he had the Babe’s farts all bottled up. It even passed the Sotheby’s “smell test” back in 1998. Why not just re-name the Halper gallery after Bud Selig? All I can say is, for all the dasterdly deeds Halper did to all, you know he is rotting in hell and that is just deserving for a low life like him. Hi, everybody! Contrary to what the last poster wrote, I’m up here in Heaven and having a great time. I’m in a suite with Jonas Salk, Eddie Gaedel and that Chinese dude who stood in front of the tank. $40 million goes a long way, even Up Here. I may be dead, but I’m still looking to wheel and deal. Does anybody want to buy Cy Young’s iPod? It’s the same one he was listening to when he bombed Pearl Harbor. Thank you for this fascinating and eye-opening article. It doesn’t surprise me at all that most of this man’s collection was faked, it was simply far too good to be true. It also does not surprise me at all that most of his authentic rare items were stolen, which I would also consider his Lou Gherig jersey traded for booze to be. I would bet that what Mr. Halper indeed found was that most of these priceless artifacts, like Shoeless Joe’s bat and uniform, the first baseball, and jerseys from the 19th century probably ceased to be or were lost decades before he came looking for them. One hundred years is a very long time for something to survive in mint condition, the odds of that alone are very high; for one man to find all these impossibly rare artifacts still in mint condition and bring them all together under one roof is impossible. So he created fakes, and his status as baseball’s no. 1 collector made their provenance indisputable, that seems to be the way the memorabilia industry works, you pay not for what you’re buying, but for who you’re buying it from. I collect vinyl records and it works the exact same way. The same deal with his stolen artifacts, I’m sure that the owners refused to or couldn’t sell them, and they were the only ones in existence, so he just took them. Imagine the snicker on his face coming home with the Gehrig uniform for booze, this guy was a joke. Major thanks for the blog.Much thanks again. Great…. Major League Baseball will test for human growth hormone throughout the regular season and increase efforts to detect abnormal levels of testosterone, a decision the NFL used to pressure its players.Baseball players were subject to blood testing for HGH during spring training last year, and Thursday’s agreement between management and the Major League Baseball Players Association expands that throughout the season. Those are in addition to urine tests for other performance-enhancing drugs.Under the changes to baseball’s drug agreement, the World Anti-Doping Agency laboratory in Laval, Quebec, will keep records of each player, including his baseline ratio of testosterone to epitestosterone, and will conduct Carbon Isotope Ratio Mass Spectrometry (IRMS) tests of any urine specimens that “vary materially.”"This is a proud and a great day for baseball,” commissioner Bud Selig said following two days of owners’ meetings. “We’ll continue to be a leader in this field and do what we have to do.”The announcement came one day after steroid-tainted stars Barry Bonds, Roger Clemens and Sammy Sosa failed to gain election to the Hall of Fame in their first year of eligibility.Commenting on the timing, Selig noted the drug program changes had long been in the works “but it wasn’t too bad, was it?”Selig reflected on how far baseball had come on performance enhancing drug issues.”This is remarkable when you think of where we were 10, 12, 15 years ago and where we are today,” he said. “Nobody could have dreamed it.”Baseball began random drug testing in 2003, testing with penalties the following year and suspensions for first offenders in 2005. Initial penalties were lengthened from 10 days to 50 games in 2006, when illegal amphetamines were banned. The number of tests has gradually increased over the past decade.Selig called the latest change a “yet another indication how far this sport has come.”Rob Manfred, baseball’s executive vice president for economics and league affairs, said each player will be tested at least once.”Players want a program that is tough, scientifically accurate, bac moncler sale ked by the latest proven scientific methods, and fair,” union head Michael Weiner said in a statement. “I believe these changes firmly support the players’ desires while protecting their legal rights.”Selig praised the cooperation of the players association, once a staunch opponent of drug testing, in agreeing to the expansion.”Michael Weiner and the union deserve credit,” Selig said. “Way back when they were having a lot of problems I didn’t give them credit, but they do.”Christiane Ayotte, sale moncler down director of the Canadian laboratory, said that the addition of random blood testing and a “longitudinal profiling program makes baseball’s program second to none in detecting and deterring the use of synthetic HGH and testosterone.”She said the program compares favorably with any program conducted by WADA.HGH testing remains a contentious issue in the National Football League. At a hearing last month, U.S. Rep. Elijah Cummings, the ranking Democrat on the House Oversight and Government Reform Committee, accused the moncler sale NFL players’ union of trying to back out of HGH testing.